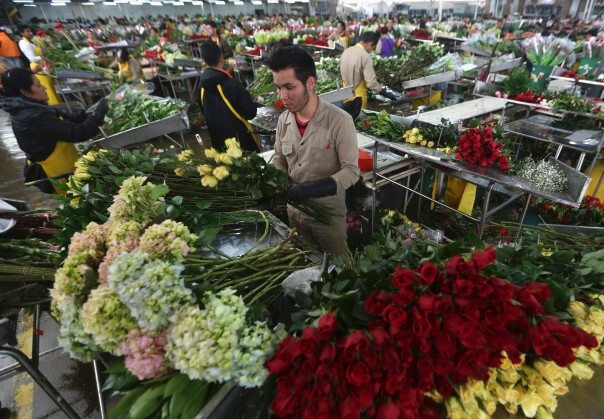 (P1) Colombian flowers flooded the world markets for VALENTINE’S DAY, the government here announced, saying that 500 million BLOOMS had been EXPORTED for the CELEBRATION. (P2) “With flowers grown by Colombian hands, the whole world today is expressing its love,” said Colombian President Juan Manuel Santos on his Twitter account. (P3) According to figures compiled by the Trade, Industry and Tourism Ministry, of the 500 million flowers sent abroad for Valentine’s Day, 76 percent were headed to the United States. (P4) The report adds that 80 percent of the flowers that Americans give come from Colombia. (P5) Among the 90 nations buying Colombian flowers, other major markets for Valentine’s Day blooms include Russia, Japan, the United Kingdom and Holland, the ministry said. (P6) Flowers are one of Colombia’s main export products, with $1.308 billion in sales last year. (P7) The ministry said that Colombia exports three basic types of flowers – CHRYSANTHEMUMS, CARNATIONS, and ROSES. (P8) Colombian Trade Minister Cecilia Alvarez Correa said that the United States, followed by Russia and Canada, is the main purchaser of Colombian roses. (P9) Japan buys the most carnations, and chrysanthemums are big sellers in the United States, Britain and Chile. (P10) The Agriculture Ministry says that Colombia has about 17,900 ACRES devoted to flower growing, and 130,000 people work in the flower industry, many of them females. Is Valentine’s Day (February 14) a popular holiday in your country? What is the best way to celebrate Valentine’s Day? Do you ever buy flowers for your romantic partner? Have you ever grown flowers? What kinds do you like to grow? Why is Colombia a good place to grow flowers?